Total cost: £675 for 5 kits (5x ponds) plus £100 postage (all plus VAT). The methodology document is very well written and easy to follow. When unpacking my delivery box I cross-referenced each piece of the kit with the methodology document to ensure I had everything and understood how to complete the test prior to traveling to site. 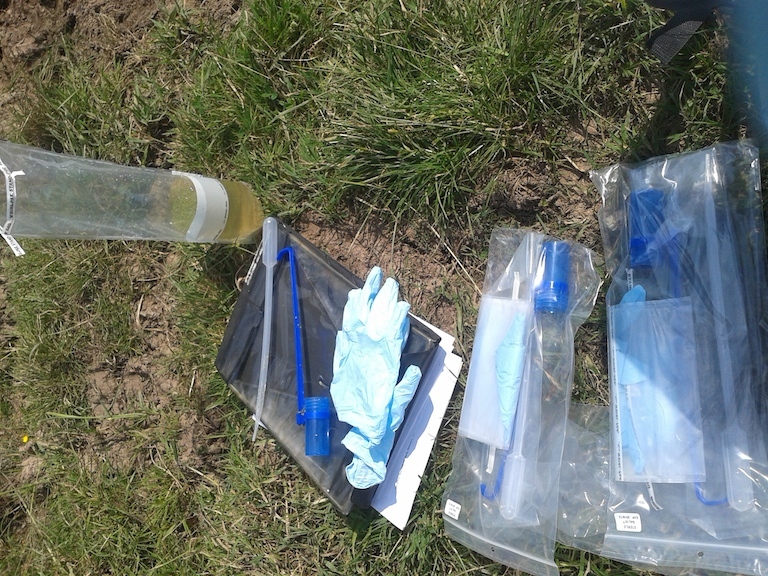 Each kit contains a box of 6 tubes partially filled with ethanol, two pairs of rubber gloves (one to wear whilst collecting the water samples then you wear a new set of gloves to fill the ethanol tubes), the Whirl Pak, a blue ladle for collecting the water samples, and a clear pipette. When the kits arrive you need to put them in a plastic bag and place them in a normal domestic kitchen fridge. Placing them inside a bag ensures that food in your fridge does not contaminate the kits. 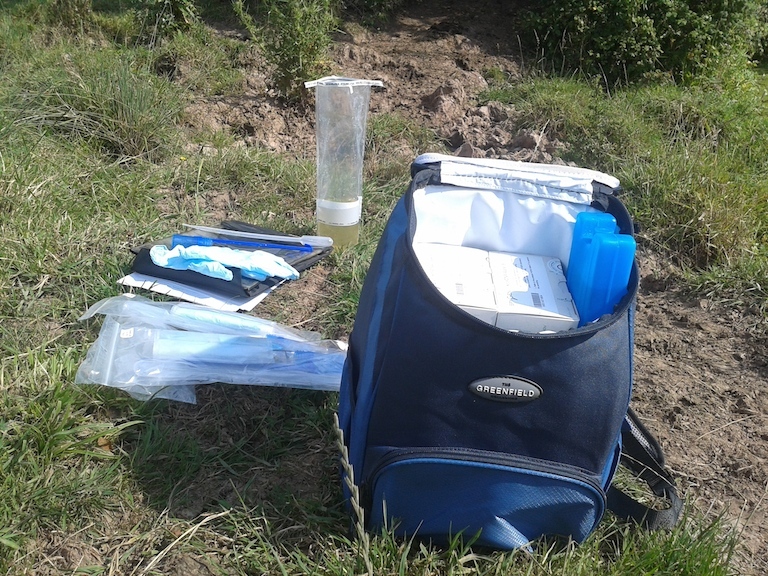 I have a Greenfield ‘cool-bag’ backpack and had put some picnic ice packs in the freezer ready for the arrival of the kits so that I could keep the kits cold whilst completing the tests. It was a very hot afternoon when I completed the tests so I was glad I had thought ahead! 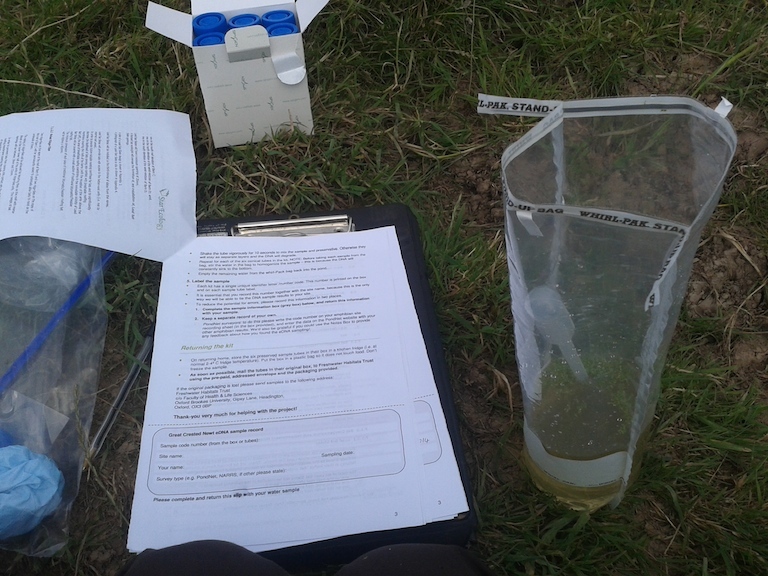 Completing the tests is very straightforward, but I did encounter some difficulties: You need to take 20 water samples from different areas of the pond (at approx. 2m intervals) – you cannot stand in the water as this could transfer DNA from one pond to another. With the ponds I was sampling it was difficult to get to 20 different locations around the pond as they are situated in the middle of cow fields with poaching by cattle at the edges and are very over grown/shaded by trees and marginal vegetation. The 20 water samples need to be placed in the Whirl Pak. 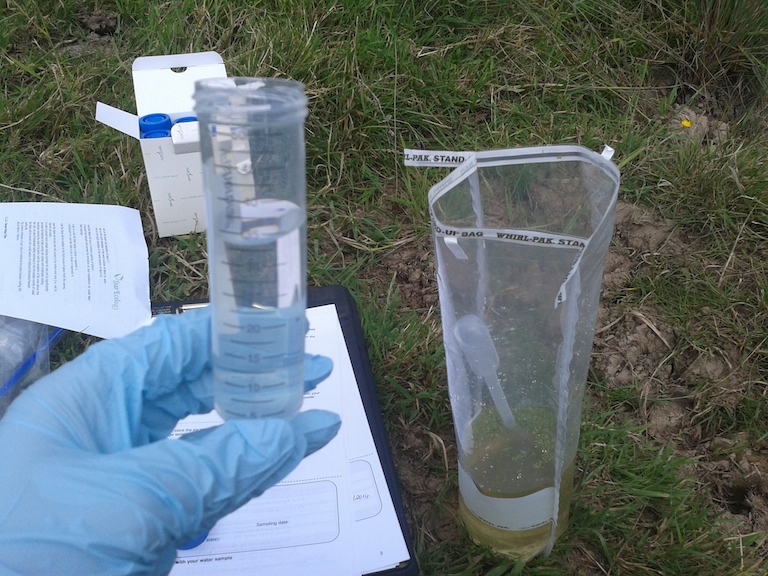 Another difficulty with the collection of 20 water samples is that you need to whirl a column of water when taking a sample but avoid getting any sediment from the bottom of the pond in the sample as GCN DNA can stay in the sediment of ponds for years. If sediment is included in the sample it could lead to a false-positive result, due to historic DNA in the sediment – not good! This is quite difficult in ponds that are drying out or are heavily silted-up. Once the 20 water samples have been added to the Whirl Pak the instructions say to close the pack using the top tabs and shake it vigorously for 10 seconds to mix the DNA. I couldn’t seem to get the Whirl Pak to close but if you press the tops together as tightly as you can and then roll the top of the bag down over itself a few times you can shake the bag without losing any of the water. You then use the long pipette to draw water out of the Whirl Pak (which does stand up on its own – as per the instructions – very useful!!) 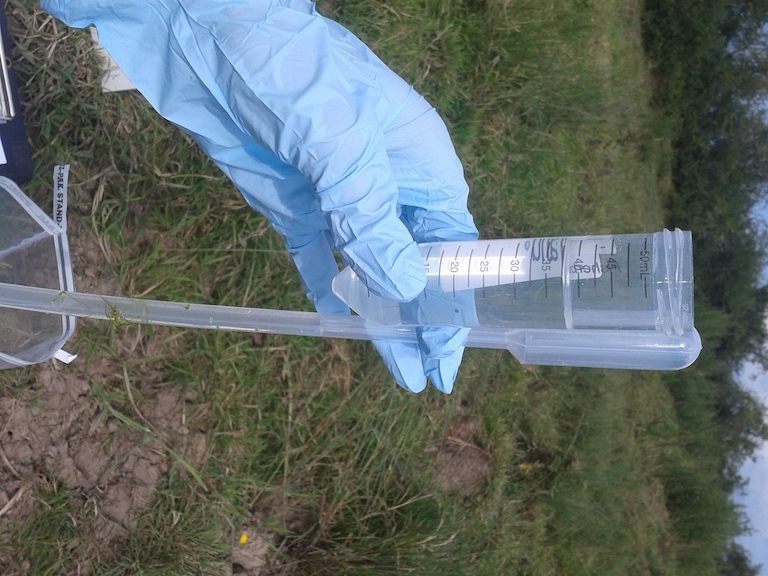 and add 15ml to the tube of ethanol, filling the tube up to the 50ml measurement line. Fasten the top tightly and shake vigorously for 10 seconds to mix the sample with the ethanol, then repeat the process for the remaining 5 tubes. Once all 6 tubes are filled you pour the remaining water from the Whirl Pak back into the pond. 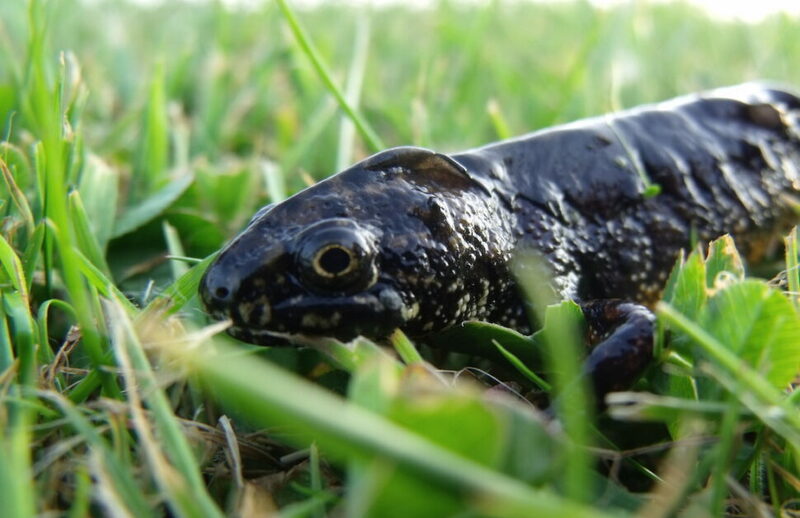 Each kit has a unique reference number and the methodology document contains a tear off slip for you to complete including Kit Reference Number, Site Name, Your Name, Sample Date, and great crested newt survey technique (e.g. netting). You need to make sure you write this down at the time of completing the test particularly if you are testing more than one pond. You also need to make an additional copy of this slip for your own records as the slip needs to be returned with the kits. 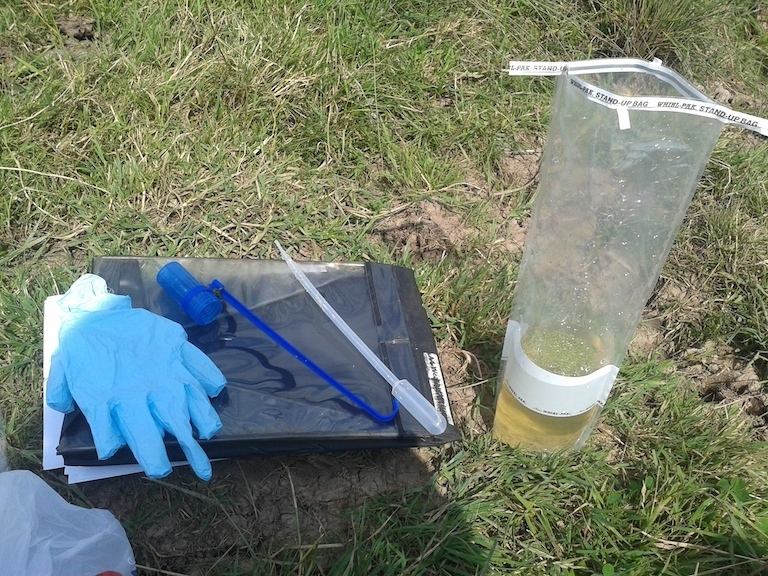 At each pond I carefully placed the blue ladle, pipette, Whirl Pak and gloves back inside the re sealable plastic bag and made sure it was tightly sealed before moving on to the next pond. This was to ensure there was no contamination between the equipment used. Each pack is in a sealed bag that you tear open but I wanted to make sure no water residue from the previous pond came into contact with the other kits. There was no pre-paid addressed envelope in the packaging and as we are mailing ethanol which is a dangerous substance I will need to call the Freshwater Habitats Trust to find out what courier we need to use. I don’t know if they have been swamped with orders or my sampling kit was a one-off and poorly put together, but it is concerning that incomplete kits are being sent out. 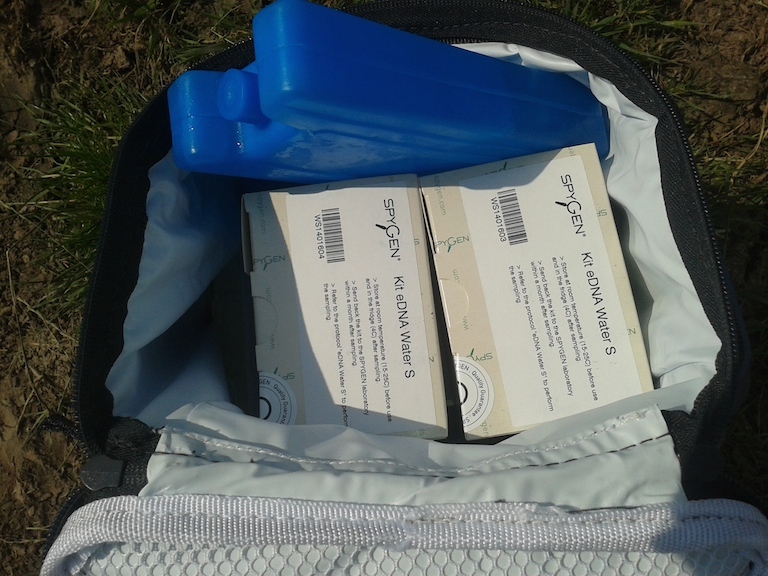 Also, the kits came from SpyGen in France but are being returned to the UK for testing. They were ordered on 18th June and the shipping slip states they were sent on 25th June. That is frankly unacceptable given the time scales involved in GCN surveys. 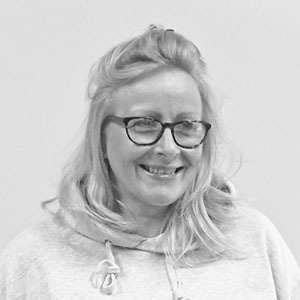 They then arrived at 12:30pm on 30th June, a full 9 working days later, which caused a lot of anxiety for the client and me, followed by a mad dash to site to complete the tests within the (somewhat arbitrary) cut-off date of 30th June. I really think if this process is going to be scaled up and potentially become a national standard, they need to speed up the delivery process considerably. This could be achieved by having the kits available and stocked in the UK. I really hope you enjoyed reading this review, and we’ll be sure to post the next update when the results come back. 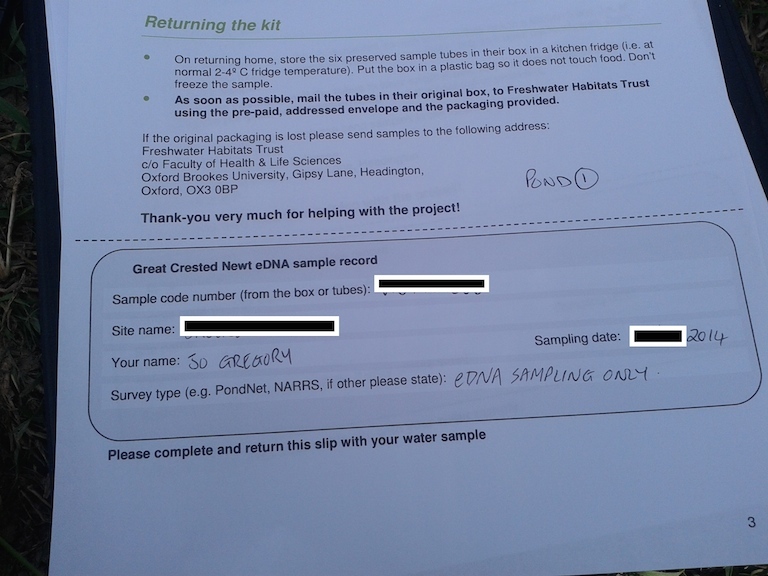 If you have used the SpyGen eDNA testing protocol for GCN in the UK, or Europe, and would like to add your comments below, good or bad, I’d love to hear form you. Also, if you found this review useful and would like to share it, please tweet it to @SuperFastSurvey or Facebook share. 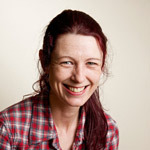 -Jo.